German and Roman chamomile have been used for centuries as medicinal plants. The Egyptians believed the plant was a treatment for “ague,” or malarial fever. The origin of the name chamomile comes from the Greek kamai (on the ground) and melon (an apple). This name referred to the freshly harvested plant, which carries the scent of apples. During the Middle Ages, the plant was cultivated for use as an aromatic stewing herb. In Europe, the herb became something of a cure-all. Germans use the phrase alles zutraut (capable of anything) to describe chamomile. The plant reached its pinnacle of popularity in 1987, when the Germans named it “plant of the year” (a kind of Academy Award of plants, I guess). Today, the chamomile industry is huge in Europe. Chamomile is found in liquid and dried preparations for internal use, ointments, creams, bath products, cosmetics, and even hair dyes. In Germany alone, more than ninety licensed products contain chamomile. Since the intent of this book is to transform you into a responsible herbal consumer, not a botanist, I won’t burden you with the confusion surrounding different forms of chamomile. Two major forms are used worldwide German and Roman chamomile. With the exception of Great Britain, where Roman chamomile is preferred, German chamomile (previously referred to in older literature as Matricaria chamomilla) is the most commonly used and best researched form of chamomile. Since it’s also the most frequently used in the United States, we’ll limit our discussion in this chapter to the German form. Chamomile is a member of the daisy family and is native to Europe and western Asia. An annual, it grows from 1 to 2 feet high and forms distinctive yellow flowers with white rays. The flowers typically bloom in late July or early August. Traditional and modern medical preparations of chamomile use the flower heads just prior to blooming. The potency of various chamomile teas varies, with some containing significantly more chamomile than others. The more potent teas are also more likely to cause side effects in people who are vulnerable to them. Consequently, it is safest to start with a low dosage and work up to larger doses slowly. Chamomile contains chemicals called flavonoids. These flavonoids are a type of nutrient present in many plants, and they play a significant role in chamomile’s medicinal effects. 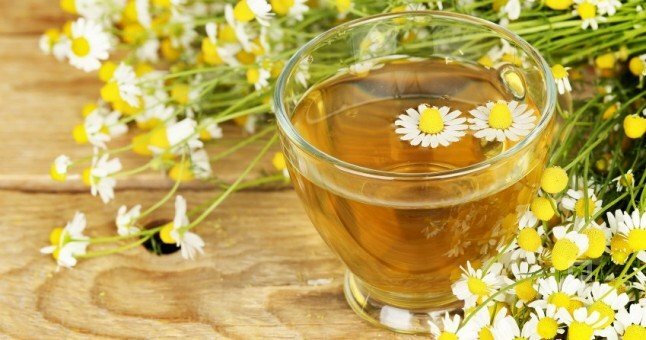 The use of chamomile for medicinal purposes in the traditional system of medicine is mostly guided by the pharmacopoeias. The pharmacopoeias are authoritative texts that specify how to identify the correct plant, which plant part is to be used, what physical and chemical qualities of the drug are required, and how the drug formulations should be prepared and administered to the patient. These specifications ensure that the drug is effective. In addition to the pharmacopoeias, there are other authoritative texts such as compendiums and monographs that provide guidance on the effective formulations and use of chamomile. The chamomile flowers used as whole flowers or extracts in alcohol or water are made from the dried flowers. The essential oil of the flower is also used. The whole flowers are used as teas, tinctures, tablets, and compresses. The guidelines in many of the pharmacopoeias specify that the flowers used for medicinal purposes should have a minimum of 0.4% volatile oil content (Schilcher 2005a). The hydroalcoholic extracts of the flowers and the hydrodistilled essential oils are used in creams, lotions, and aromatherapy. The teas, tinctures, and extracts are prepared according to prescribed specifications. It should be considered whenever the GI tract is either cramping or irritated due to anxiety or stress. 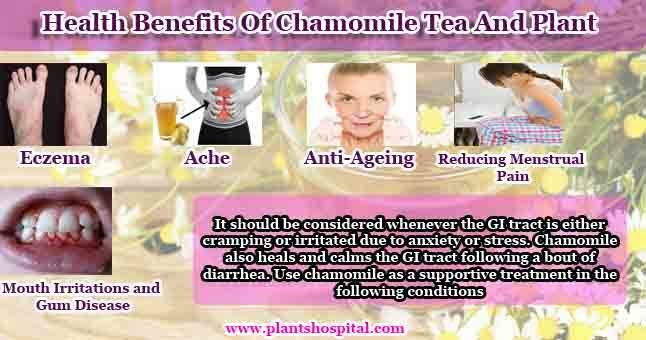 Chamomile also heals and calms the GI tract following a bout of diarrhea. One study found that a tea that combined chamomile, vervain, licorice, fennel, and lemon balm was effective in relieving colic in infants more effectively than a placebo tea. The dose of tea used in the study was approximately 1/2 cup (150 milliliters) given during each colic episode for a maximum of three times per day. Remember that inflammatory conditions of the GI tract, such as ulcers, Crohn’s disease, and ulcerative colitis, can also lead to bleeding and possible anemia. While chamomile may help in the long-term management of these serious conditions, it should not be thought of as a substitute for proper medical monitoring and more aggressive short-term therapies. Chamomile can be used as part of a program to keep your GI tract well. In addition to helping maintain normal GI tone, it also stimulates normal digestion. Because of its soothing effect on mucous membranes (the area lining the inside of your mouth and GI tract) and healing properties, chamomile is also useful for the treatment of canker sores and other irritations or sores inside the mouth. The added chamomile of antibacterial activity by the essential oil constituents makes it potentially valuable in the treatment and prevention of gum diseases such as gingivitis. The best approach here is to gargle with a strong tea several times daily. Topical application to the gums is also useful for infants during teething. I usually recommend that parents apply a strong tea or liquid extract directly to the gums every 2 to 3 hours. Chamomile will help your child’s gums feel better and may also exert a calming effect that will help them sleep. Chamomile is widely used in Europe for the treatment of skin irritations. Topical chamomile creams and ointments are used to treat eczema, insect bites, and poison ivy or poison oak rashes. I find it useful in combination with calendula (marigold) ointment or cream for the treatment of diaper rash in infants. Owing to the aforementioned wound-healing and antibacterial effects, Europeans often apply chamomile in wound dressings. Topical use of chamomile ointment was also found to successfully treat mild stasis ulcers in elderly bed-ridden patients. Topically, chamomile may also work well for eczema. Remember, it’s not the knockout punch some people are looking for. One study found chamomile to be about 60 percent as strong as 0.25 percent hydrocortisone when applied topically. In a study with eczema patients previously treated with a topical anti-inflammatory (difluocotolone valerate), a topical chamomile cream was found to be about as effective as 0.25% hydrocortisone in alleviating symptoms. Further adding onto chamomile benefits, the herb is a wonderful for soothing an upset stomach. Helping to soothe and relaxe the muscles and lining of the intestines, chamomile can help with poor digestion and even those suffering from irritable bowel syndrome. Chamomile tea is a powerhouse of antioxidants and protects the skin from free-radical damage. It accelerates cell and tissue regeneration, helps tighten the pores and slows down the ageing process. Several studies have linked chamomile tea to reduced severity of menstrual cramps. A 2010 study, for example, found that consuming chamomile tea for a month could reduce the pain of menstrual cramps. Women in the study also reported less axiety and distress associated with period pain. Anecdotal evidence and some studies suggest that inhaling steam with chamomile extract can relieve some of the symptoms of the common cold. Chamomile tea, as described by the German Commission E monograph, is prepared by pouring 150 mL of boiling water to one heaped teaspoon (3 g) of chamomile flowers. It is kept covered for 5–10 minutes and passed through a strainer. It has been found that the tea contains the spasm-reducing (spasmolytic) compounds— the flavonoids. The tea, however, cannot reduce internal inflammation because it has extremely low amounts of the anti-inflammatory compounds, which are mainly found in the essential oil. The tea contains only 1%–3% of the essential oil. However, if the tea is externally applied, it reduces inflammation. This herbal tea is probably the most well-known of all the ‘calming’ teas, particularly when it comes to relieving stress and helping us get a good night’s sleep. 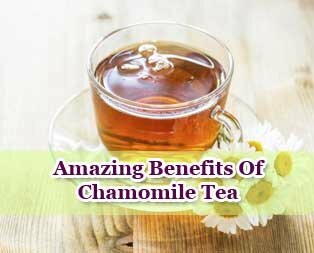 A lesser known benefit of chamomile tea is that it may lower blood sugar levels which means it might just control, or even prevent, diabetes. The essential oil of chamomile is present in the whole plant. However, the essential oil content is higher in the flowers than in other parts of the plant, and also has higher levels of useful compounds. Therefore, the essential oil of the flowers is mostly used for medicinal and aromatic purposes. The essential oil of chamomile is obtained by theprocess of steam distillation or hydrodistillation, in which the flowers are subjected to high pressure, temperature, and steam to separate out the essential oil from them. The oil is deep blue or ink blue in color and has a characteristic sweet, grassy smell. It may turn green and then dark brown on oxidation and lose its therapeutic value. At the time of distillation, it is extremely concentrated. The quality of the essential oil may differ from one variety of chamomile plant to another, but the various pharmacopoeias clearly mention that to be used for medicinal purpose, the oil content should be 0.4% in the flowers. The oil is prone to vaporization and decomposition, and so it has to be stored carefully in dark bottles under the prescribed temperature. Essential oils are absorbed into the body on inhalation and through the skin. The compounds penetrate the skin and enter the bloodstream and act as medicines. The essential oil of chamomile is extensively used in aromatherapy, massage, and baths. Aromatherapy is a technique of healing where the patient is made to inhale the vapors of the essential oil. A few drops of chamomile oil are applied on a piece of cloth or handkerchief or tissue and slowly inhaled. Sometimes a few drops of oil are added to hot water and the steam is inhaled. Chamomile oil vapor is used extensively in aromatherapy to calm a person and reduce pain and anxiety. A massage with oil enables the medicinal compounds to penetrate the skin and enter the bloodstream. For the purposes of massages, the chamomile oil used is diluted with other oils such as olive oil, sunflower oil, or lavender oil. The oil is gently rubbed or massaged on to the inflicted part. In many disease conditions, a hot bath or a cold bath is given to a patient. In hot baths, warm to hot water is used and in cold baths, cold water or ice is used. A few drops of chamomile essential oil are added for healing purposes. Sometimes whole chamomile flowers are put in a small bag and kept in the bath. A compress is made by steeping a cloth or a towel in a bowl of hot (hot compress) or cold (cold compress) water. A few drops of chamomile oil are added in the water before steeping the cloth or towel. This compress is then applied to the affected part. How Should You Prepare Chamomile Tea at Home? Boil 10 ounces of water for every glass of tea you wish to prepare. Measure two tablespoons of chamomile blossoms that have been dried. You can also use four tablespoons of fresh chamomile flowers for each 8 ounces of water that you heat up. When measuring the new or dried blossoms, you need to pack them carefully on the measuring spoon. Reduce or increase the number of chamomile flowers to water to prepare stronger or weaker tea. Remove your pot of water from the source of heat immediately the water starts to bubble quickly. Pour the already boiled water in a teapot and then add your chamomile blooms. Allow the blooms to steep in the hot water for about five minutes. You can increase or reduce the time for a stronger or weaker tea. Place a strainer in the mug or glass and then pour the chamomile tea. Your tea is ready for consumption.